Last summer, I went through a period where I was having a lot of difficulty finding time and space to myself. I lived with a lot of people and I worked with a lot of people, so alone time was hard to come by. And without alone time, I wasn’t reading anywhere near as much as I wanted to be. So I shifted the structure of my days, just enough. Instead of hanging around my apartment being useless and annoyed until I needed to leave for work, I left an hour or so earlier than I needed to, got off the bus in Harvard Square, bought an iced coffee, and spent the remaining time in JFK Park with my book. It changed everything. Having somewhere to escape to—somewhere away from all of my roommates and friends and coworkers, somewhere no one was going to talk to me or interrupt me or ask me to do anything—saved my sanity those couple of months. 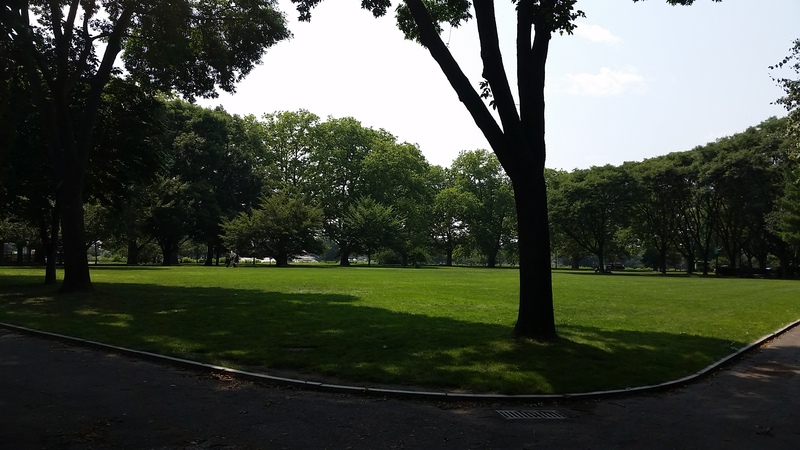 Even though JFK Park is a public place full of people, I felt like it was my own sanctuary, a beautiful little patch of green designed specifically so that I could lie on my stomach in the grass with my face in a Sarah Waters novel. And though I don’t go there regularly anymore, I’m still comforted by the knowledge that it would be there if I needed it. This entry was posted in May 2015 and tagged Cambridge, Harvard Square, JFK Park, Massachusetts, May 2015, places, places to read, public parks, reading spots, Sarah Waters. Bookmark the permalink.